I gotta let you in on a secret here. It’s kind of embarrassing. I don’t want to say it too loud, so you’re gonna have to come real close so I can whisper it, ok? Okay, I’m running away now cause you probably think I’m a crazy person and totally weird, considering I’m a health nut. I guess it’s not that I don’t like fruit. It’s just really not my favorite. Give me veggies any day, and I’m all over it! * Bananas – absolutely NOT. Blegh! Apples, oranges, peaches, strawberries, and fresh pineapple are all on my “safe” list, and I eat them all often. But if it weren’t for smoothies where I can mix it all up into something delicious, I wouldn’t get nearly enough fruits in my every-day. So when I decided to make a fruit salad, I was sure I had lost my mind. Why would I make something that does nothing for my tastebuds?? You like fruit because you’re not a weirdo like me! Okay, so back to the secret. 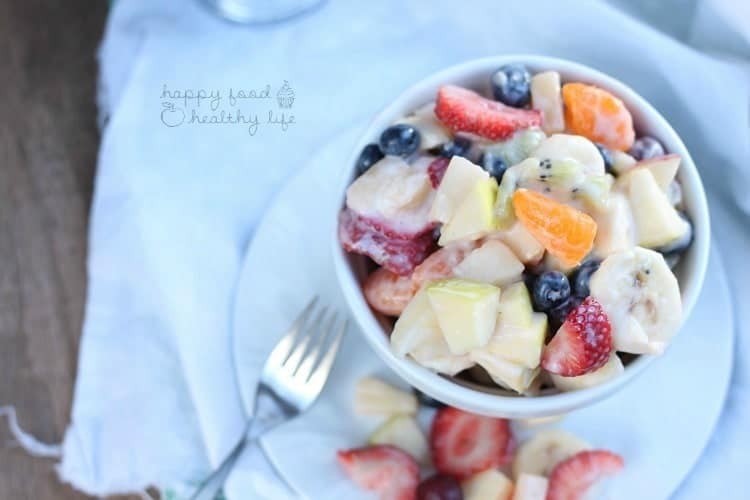 I LOVE this fruit salad!!! Seriously. I couldn’t stop eating it (well, minus the bananas because no.. i can’t)! Me, the fruit weirdo. I ate it for breakfast. I had it later that day for a snack. And then I had it the next morning with my oatmeal. 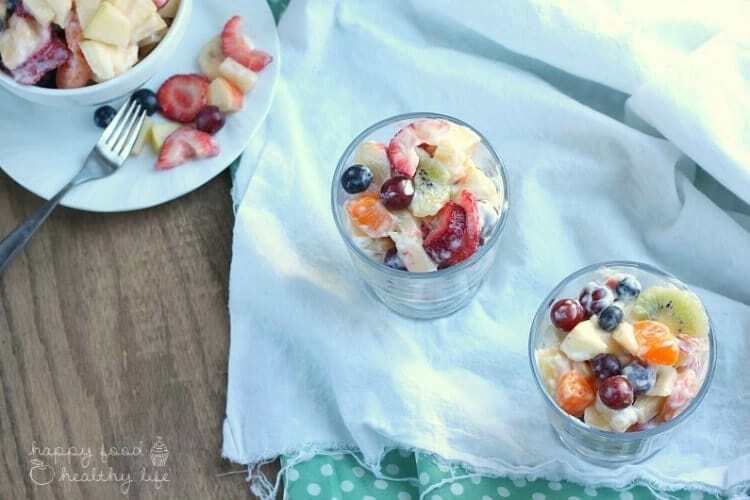 I never thought I’d be so in love with a fruit salad. But I admit that I totally am. So there you have it. This salad can totally convert people. Think about how much you’ll love it because you’re already a fruit lover! Drain the canned pineapple, reserving the juice for the dressing. Set pineapple aside. To prepare dressing, in a small saucepan, combine the pineapple juice, coconut oil, sugar, lemon juice, cornstarch, and water. Bring to a boil, reduce heat, and simmer, stirring until thickened. Remove from heat and cool completely. When cooled, stir in Greek yogurt. Refrigerate until ready to serve. 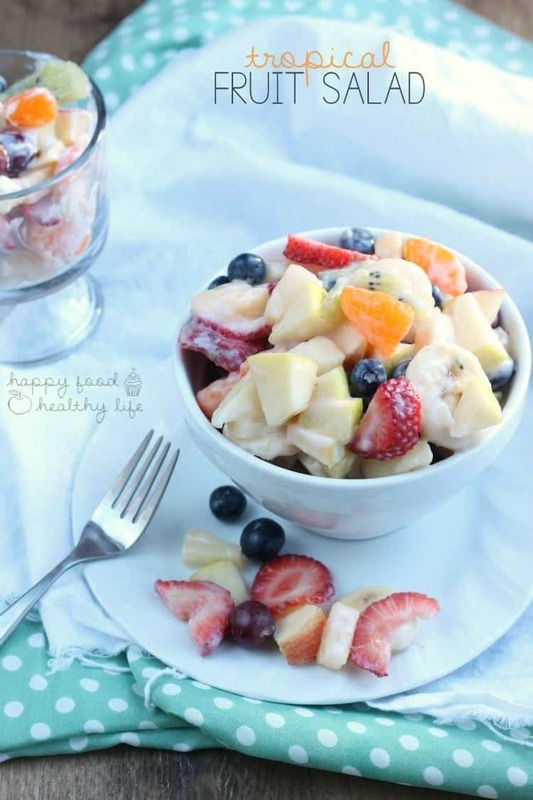 For salad: In a large bowl, combine the pineapple, apple, grapes, banana, kiwi, strawberries, blueberries, and orange. Toss together well with the dressing right before serving. 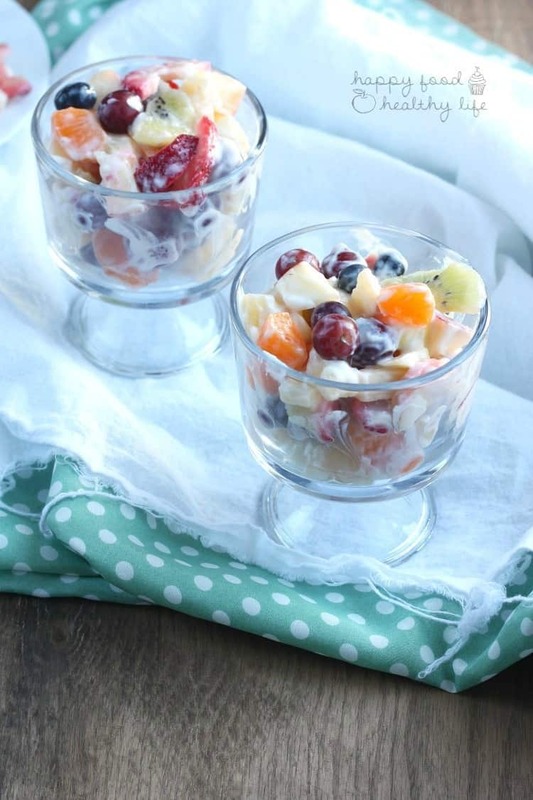 Looking for more fruit recipes? I am with you on the bananas. I can’t bring myself to eat a fruit salad if there are bananas in it.